Hello everyone! 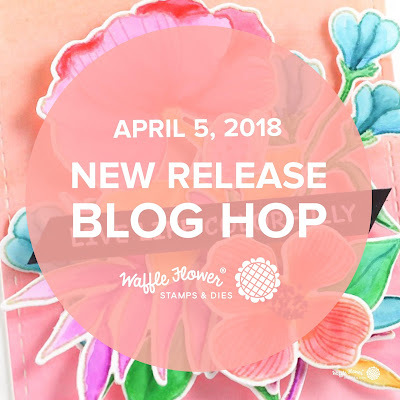 Today I'm thrilled to be hoping along with Waffle Flower to celebrate their April release! I've made two cards featuring the stamps sets "Bouquet Builder 1" and "Rainbows". ¡Hola! Waffle Flower acaba de lanzar su colección de Abril y este post forma parte de un blog hop para celebrarlo. He hecho dos tarjetas usando los sets de sellos "Bouquet Builder 1" y "Rainbows". Since rainbows are a big part of this release, I decided to create two rainbow cards using two different mediums: Distress Inks for the first one and Copic Markers for the second. Como los arcoíris son una parte importante de la nueva colección, he decidido crear dos tarjetas con colores del arcoíris pero usando dos técnicas diferentes: tintas Distress para la primera y rotuladores Copic para la segunda. All the details about these two cards can be found in the video below (you can also watch at my Youtube channel). Todos los detalles sobre estas tarjetas los encontraréis en el vídeo de aquí abajo (o también podéis verlo en mi canal de Youtube). To celebrate this amazing new release, Waffle Flower is giving away $25 gift certificates to FIVE lucky winners. Just leave comments along the blog hop by 11:59 pm ET on 4/09/2018 for a chance to win. 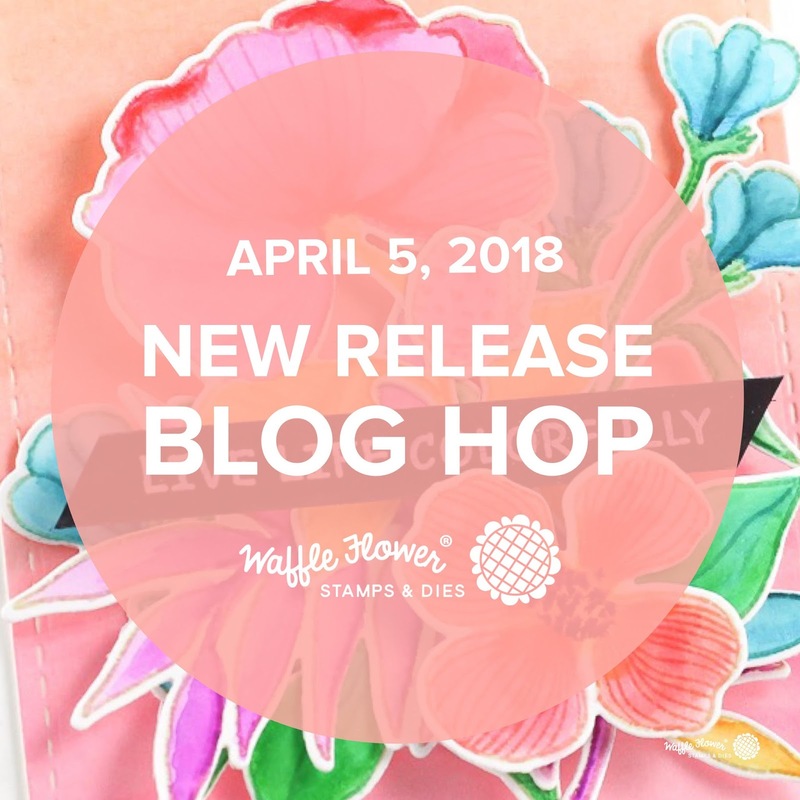 Winners will be chosen at random from the comments left on any of the posts on this blog hop and will be announced on the Waffle Flower blog on 4/11/2018. Also, all orders placed by 11:59 pm ET on 4/09/2018 will receive a 3x4 Perfect Picture stamp set while supplies last. No code required. Para celebrar esta nueva colección, Waffle Flower regala un certificado de 25$ a CINCO afortunados. Solo tenéis que dejar comentarios en las paradas del blog hop hasta las 11:59 pm ET del 9 de abril de 2018 para participar. Los ganadores se escogerán aleatoriamente y se anunciarán en el blog de Waffle Flower el 11 de abril. Además, todos los pedidos hechos antes de las 11:59 pm ET del 9 de abril de 2018 recibirán el mini set "Picture Perfect" hasta agotar existencias. No es necesario ningún código. And now...let's hop! Your next stop is the talented AMY R!!! Lovely cards! I am a fan of florals. Such beautiful cards. Love them!! absolutely stunning card ! love the soft rainbow! Beautiful cards! I love these stamps!! These cards are gorgeous! Love the colors! Such a great set and both of your cards are lovely Amanda. Those florals are so pretty! Beautiful cards! Your cards are beautiful - I love both versions of the rainbow! The color-coordinated sequins are just the right touch on the second card - so pretty! I love both cards but my favorite was the second one done in the color markers then the sequence to match the colors. I liked that. Love both of cards. I need to try! So lovely...thanks for the inspiration! GASP! Amanda, both versions of your cards are breath-taken-away gorgeous! Talk about impressive showcases of this new set! Absolutely amazing cards, it’s impossible to pick a favorite. Thanks for the inspiration. Great cards you made! The colors are wonderful. Thanks for sharing and have a great week. Love the fun simplicity in your design! Rainbows are such fun. Love your designs. Beautiful cards perfect for spring! What a wonderful design incorporating both sets. Both cards turned out beautifully! Very beautiful cards. I love your pastel rainbow colors. Lovely cards! It's so fun to see how the different color combos change the look of the cards. Beautiful...the soft colors of the second one makes me want to touch it! very beautiful and clever design, especially use of distress inks. Love these cards! Especially like the second one, your coloring is so beautiful. so perfectly. I love a rainbow of color! I am so inspired ,now I must have this stamp set, very pretty! Lovely cards. I loved the video which I happened to watch first :) Thanks for making one. I love to see you working! Hi, awesome cards, they are both so beautiful. love the colors they are so pretty. I am a copics girl myself, time for me to learn something new. especially luv the card with distress ink blending! Watched the video this morning. Love these cards! Love how these turned out and appreciate seeing two different mediums to make same card design. Just beautiful! Gorgeous cards! And thank you so much for the video. Wow! Such beautiful cards! You brought them to life with such colorful creativity! So fun and relaxing to watch and such great inspiration! Thank you! I love both of your cards, but especially, the copic marker one. Thanks for sharing. Thanks for showing the versatility of this set. I love your cards. Love both your cards very nice. Gorgeous use of rainbow style coloring to create these cards. I am inspired! Love the colors you chose, rainbows of course. I love both variations! You can't go wrong with a happy rainbow of colors. Your cards are so pretty! Never would have thought to color them as a rainbow. Very nice! Beautiful cards... love the soft colors. What lovely cards, simple and easy, I need that every so often! Wonderful stamps, wonderful card! I love your added bling! Love this stamp & die set. It makes such a beautiful card. The two are cards are so pretty and delicate. Love the two color variations on your cards. One in pale hues and one with more intense colors. Both are gorgeous! Beautiful cards! I love that one is bright and vibrant, the other soft and subtle - just lovely! Just loving this Bouquet Builder 1 stamp. Loved both of your beautiful cards. Just beautiful, Amanda! I love the two ways of coloring in the images that give such different looks. Also, the embellishments you used are spot on for each style. Thank you so much for sharing with us! Love both of your rainbow cards! Very pretty! I do think I like the copic one the best but it is a hard choice! Thank you! Your cards are gorgeous - love that rainbow effect! Both cards are amazing. I love them both! Thank you for sharing. I love your rainbow cards, both of them ! They cheer me up ! Love your cards and the rainbow colors on each!!! Lovely work! Very cool how you created 2 different cards with the same stamp placement but amazingly different feel. I love the rainbow effect on your cards. Waffle flower I love the packaging idea. Beautiful. Love the flowers/leaves and awesome colors. What a fun set. Wonderful ways of using the new products! Both of these cards are gorgeous--love how you colored them. Beautiful cards! Beautiful colors and gorgeous coloring! Love both cards... Beautiful coloring, great design and rainbow sequins! Incredible! Love the video - thank you for showing the colors you used! Beautiful rainbow cards. Love your idea! Your rainbow cards are awesome!!! Beautiful cards, thanks for the video . Love both cards, the rainbow colors are perfect. Rainbows are always a hit. Love the colors you used. Such a cute set. Love these cards! Your cards are always so beautiful. Thanks for sharing. Gorgeous rainbow cards! Love those beautiful flowers! I have to watch your video and get some tips on these pretty cards! Love your cards. Both are so pretty. Both techniques give such a wonderful result ! Beautiful cards, gotta love the rainbow. Thanks for showing 2 ways to make a rainbow with theses stamps. So pretty! Love your bright colors. Nice work! What lovely cards! It is always nice to be able to "match" the design to the sentiment and you perfected it here! Love your sweet color combos and so uplifting cards!! Great ways to inspire and motivate us to have Springtime in at least our cards! Beautiful! I enjoy coloring with distress inks also! Love the rainbow coloring on your beautiful cards! They are both amazing! Beautiful blending and coloring. Love! Gorgeous cards! The Copic one is my favorite! Your cards are beautiful without being fussy. I just love them - I can't wait to try both techniques! I love how you gave your flowers a rainbow theme! Both versions are lovely. The sequins and clear droplets were a nice finishing touch. Absolutely stunning cards. Thanks for sharing. Thank you for sharing....gorgeous cards...partial to the Copic rainbow!!! Very pretty floral cards in rainbow colors. gorgeous background - great technique! I love both cards! Great idea colouring in a rainbow with copics! Rainbows and florals two ways, both fresh and exciting. Cool flip. Your cards are beautiful, and I think your rainbow designs are super creative and fun. Love how you used the flower stamps "off the edge"! SO pretty! These are both beautifully done! So full of color and such beautiful designs. Thanks for this sweet inspiration. I really am enjoying the soft colors of the distress ink in your first rainbow card. Both are beautiful! Thanks for sharing. Oh, I like it both ways! So cool to have a way to color without the painstaking detailed coloring, too! Love your cards - and watching you as you color. I learned alot! Thanks. Hola Amanda, I love your videos. You are very talented. Thanks for sharing your ideas and inspiration with us. Seeing the soft rainbow colors and then stronger ones from the copics really shows what a big difference there is in the medium you select when making a card. Thanks for 2 great examples! Gorgeous masking! I love these florals and the two different rainbow ways you colored them! So pretty! I love how the two look so different with the different coloring mediums. Thank you for sharing! The sequins really finish the Copic card beautifully. It was worth the extra time you took to get them just so. your cards are soo lovely! thanks for sharing, and the chance to win! Love both cards but especially the second one. Nice! Love the soft rainbow contrasting to the bold bright one! Love your coloring! And love the sequin bling!